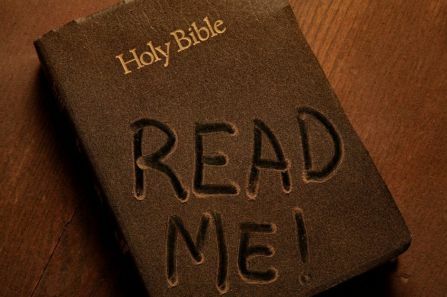 According to disturbing new studies, over 50% of Americans rarely or never read the Holy Bible. Only 1 in 10 hold a Biblical worldview. 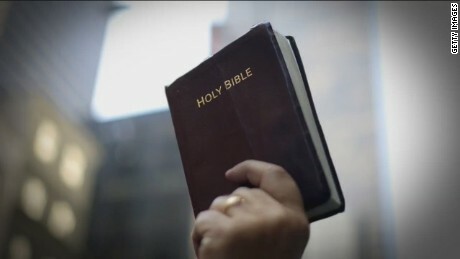 Only 25% of American Christians feel they have a personal responsibility to share the Gospel with others, and only 40% believe that the Holy Bible is truly the “Word of God”. If this were just a study of all Americans, it would be sad but not too surprising. The responses of so-called professing Christians in these studies, on the other hand, are extremely alarming. How can anyone call themself a Christian and say they have NO obligation to preach the Gospel to others? Are we reading the same Holy Bible? Are we worshipping the same Jesus Christ? The Jesus Who said to “go into all the world and PROCLAIM the Gospel to the whole creation”? What’s worse than fellow believers not sharing the Gospel message, is that the study also revealed that only 1 in 4 American Pastors say they feel a responsibility to share it. Unbelievable. No wonder Christians in this nation are so Biblically ignorant! Even the Pastors don’t know the Word of God. 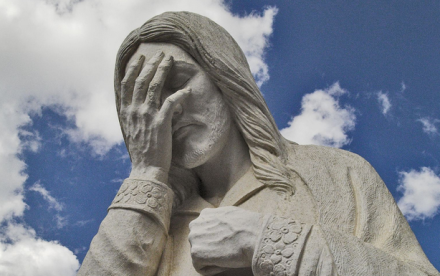 I can understand some Christians not being able to recite the 10 Commandments, or not being able to name just a few of the 16 Old Testament prophets. I’d even be able to understand if they can’t explain the Trinity or what the Rapture is. What I can’t possibly begin to grasp is how 3/4 of this nation’s believers and Pastors don’t understand that the basic preaching of the Gospel to the lost is the heart of Christianity. If they don’t believe in evangelizing others, then I believe that they are in the wrong Faith. Christianity is all about taking the Good News of what Jesus Christ did for us at Calvary and sharing it with everyone that we possibly can in this life. Jesus Himself taught this so many times, that there is no possible way you could miss it if you are a true believer. Take the Parable of the talents, or when Jesus taught of not hiding a lamp under a bushel, or when He said that the Gospel must be preached to ALL nations before He would return. Our Lord couldn’t have stressed strongly enough that we are not to keep our Salvation to ourselves. We are called to share with the whole world what He and the Father have done for us, in their forgiving our sins and blessing us with Eternal Life. I love the saying that “we are NOT saved to be SILENT.” It is so true. It is so Biblical. Too many Christians today want to accept the Gift of God, but then selfishly keep it all to themselves, and they keep the Gospel message confined to their homes or Church. If you don’t want to share this message with others, then you my friend are no Christian at all. You need to TRULY get saved, because obviously you never have been. I don’t mean to be harsh with fellow believers, but I honestly don’t think you can call yourself a believer if you don’t feel the need to bring others to Christ. I believe that the biggest reason why professing Christians don’t know, or do not want to share, the life-altering Gospel message with the unsaved is because they DON’T KNOW their Holy Bibles. Much of today’s Christianity is composed of “in-name-only” Christians. What I mean by this is that far too many people are content with accepting the Good News of Christ dying for their sins, but they don’t want to read or believe the rest of God’s Word because it may make them uncomfortable. 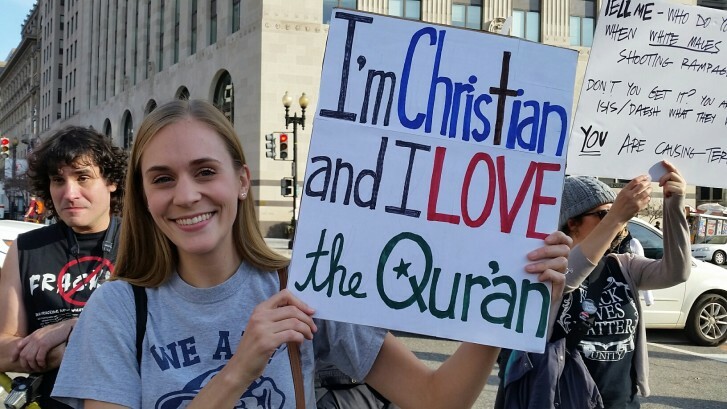 If they read the Holy Bible, and believed it like they believe that Jesus died for them, then they would become unpopular with much of their family, friends, colleagues, and the world. They know that God is against homosexuality, abortion, evolution, Islam and false religions, immoral entertainment, and so much more that they themselves do not want to oppose. So, it’s easier to just say “I’m a Christian and I’m going to Heaven, but I don’t know about all that other Bible stuff”. They do not realize that ALL of the “Bible stuff” goes hand in hand and stands as 100% TRUTH from Genesis to Revelation, no matter how “offensive” it may be to today’s generation. The recent studies back up everything I’m saying, as nearly 20% of CHRISTIANS (not unbelievers) believe that MEN wrote the Holy Bible, and NOT GOD. Christians believe this! Again I must reiterate, they are NOT Christians at all. 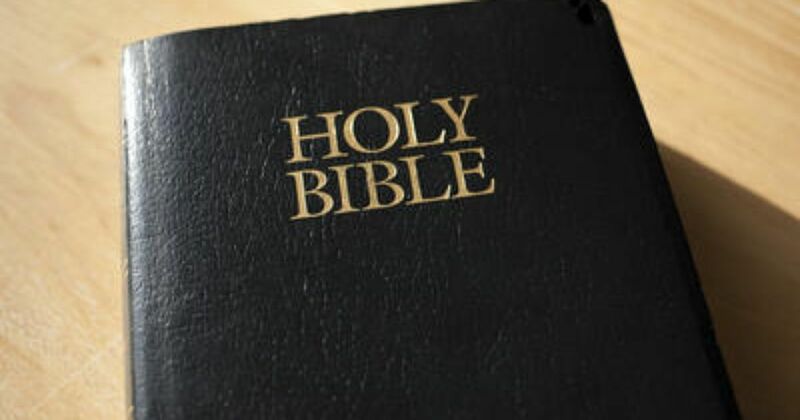 Only 40% of American Christians say that the Holy Bible is the Word of Almighty God. Less than 50% of our fellow believers believe that our Holy Book was written by God. What a shame. It certainly explains how Barack Hussein Obama got elected twice, and how a majority of Americans favor Gay Marriage, or legalization of marijuana, or many of the other immoral stains on our nation today. It also explains how Republicans, once known as the “Religious Right”, can elect Donald Trump over Ted Cruz in last year’s Presidential Election. It baffled me, but now I’m beginning to fully understand why. There are far too many “Christians in-name-only” in this Country, and our Faith is in a very sad state nationally in 2017. I wish that all of this disturbing news of the recent studies was all I had to report, but believe it or not, it gets worse. 37% of Christians today say reading the Holy Bible is important but “NOT essential” to being a Christian, and over 20% say that reading it is NOT an “important part” of their Christian “identity”. If the Word of God is not part of your life or “identity”, then rest assured, YOU will not be identified as a believer by our Lord come judgment day. Today’s wishy washy, don’t offend anyone, unBiblical Christianity is a big reason why America has been cursed for decades. It is because Christians aren’t doing their job as believers, and aren’t preaching the Word of our God to the heathen, that the rest of this nation has gone to hell in a handbasket. Over 50% of Americans have little to no experience in reading a Holy Bible. According to a research study of 1,000 Americans by LifeWay, only 11%, or 1 in 10, have read the entire Bible once. Just 9% say they have read it more than once. 12% percent say they have read a majority of the Holiest Book on earth. 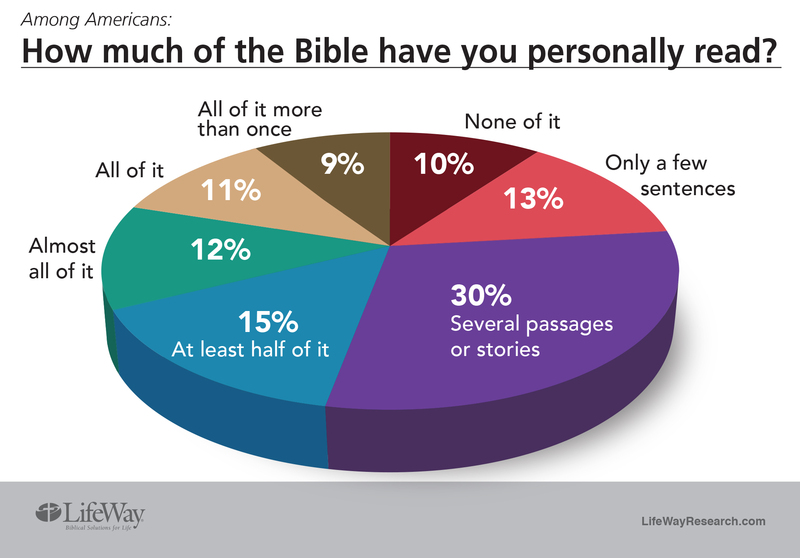 While 15% of respondents say that they have read only half of the Bible. 30% have read bits and pieces throughout their lives. 13% have read only a few verses, and 10% percent have not read it AT ALL. Yet Americans wonder why the Country just can’t be “great again” these days. Maybe it’s because 52% of Americans believe that the Holy Bible is simply a “good source of morals”, or because 37% feel that it’s just “helpful today”. No, I think it’s really because ONLY 36% believe the Holy Bible to be “TRUE”, 34% call it “A STORY”, and 14% say it is “OUTDATED”. If God’s Word is truly outdated in America, then that sure explains why America’s best days appear to be BEHIND HER. About a month ago, after years of being angry seeing such ignorance towards God’s Word in this nation and world, I had an idea. I thought, maybe the reason that people hate God’s Word so much today, or mock and belittle it, is because they themselves just DON’T KNOW IT. Any true believer cannot deny that when you read the Holy Bible, the Holy Spirit speaks to you, fills you, and becomes a part of you. So the people mocking, criticizing, and attacking our God have obviously never picked up His Word. This is what inspired me to head to my local dollar store one day and buy 20 Bibles. I myself already have a few, as do most believers, so these Bibles were not meant for me. Instead, whenever I’m at my job, or in a particular place besides home for a long period of time, I place the Holy Bibles on my car with a big inviting sign to “Please TAKE ONE”. Thanks be to God that at the end of most nights a majority, if not all, are taken. I do this as much as I can, and I’m hoping that my idea will spread and become a habit for other believers as well. The problem with today’s world is not political, but BIBLICAL. There aren’t enough Holy Bibles in the hands of Americans today, especially the youth. The recent studies revealed that young adults read much less of the Holy Bible than their elders. 25% of 18 to 24 year olds in America are the most likely to say that they haven’t read the Bible AT ALL, and a minute 2% of this age group say that they have read most of the Bible. Our solution must be to get God’s Word into the hands of as many teenagers, college kids, and young adults as possible. Will they all accept our gifts of God’s Word? Of course not. Satan has his children too. I truly believe that many of them WILL take a Bible if presented the choice though, and if we don’t put one in their path, or in their hands, then how will God’s Word ever get into their heart? Most local dollar stores sell KJV Holy Bibles, and I know that most of you can spare at least $5 to do God’s Work. So, I’m issuing a call to all of my fellow brothers and sisters who are fed up with the absence of God in this nation and in the hearts of the people: PUT GOD’S WORD INTO THEIR HANDS. Buy 3, 5, 7, 10, or even 20 Bibles and place them in public somewhere where unbelievers can find them. You may never meet the people who accept your gift, but just know that every ONE SOUL whom your Bible reaches, will reach another, and another, and another, and so on, and so on. Maybe they will start leaving Holy Bibles for others to find as well. Can you imagine the chain reaction across this nation, and the revival that could quietly be sparked, by making the Holy Bible as available to people as a local newspaper? This nation needs the Word of God more than ever before in our history, and if we don’t give it to America, WHO WILL? One Bible at a time, one soul at a time, one City at a time, one State at a time, I truly believe can lead to ONE NATION UNDER GOD all of the time. Let’s make it happen friends, because as I always say, God’s Word TRUMPS ALL.